Interest rates have reached historic lows over the past decade, raising questions about how such an environment affects investor risk-taking behaviour. This column uses randomised investment experiments in the US and the Netherlands to answer these questions. Results show that low interest rates lead to significantly higher allocations towards risky assets in both samples. The likely mechanisms relate to investor psychology, including reference dependence and salience. The impact of low interest rates on financial markets has been a central issue in recent years, as central banks in many countries reduced rates to historical lows (Bernanke 2013, Stein 2013, Rajan 2013, Powell 2017). A widely discussed question is whether such low interest rates may induce a greater appetite for risk taking in financial markets, which is often referred to as ‘reaching for yield’ or the ‘risk-taking channel’ of monetary policy. This question is of considerable interest to policymakers, researchers, and investors. The Dutch Authority for the Financial Markets (AFM), for instance, identified “search for yield in a low interest environment” as one of the top ten risks in its 2017 supervisory agenda. On a positive note, increased risk taking may help to boost capital markets and stimulate the economy, and function as an additional transmission mechanism of monetary policy. However, it may also pose challenges for financial stability. Why might investors reach for yield? A number of studies examine this question through the lenses of institutional frictions, such as agency problems or funding conditions of financial intermediaries. While institutional frictions are very important, they might not be the entire story. Yield seeking behaviour also seems common among individuals and households, but these individual-level mechanisms are much less understood. In a recent paper, we present evidence that reaching for yield is not confined to institutions (Lian et al. 2018). Rather, it can be driven by preferences and psychology, and arise from the way people perceive and evaluate return and risk trade-offs in different interest rate environments. To document this behaviour in a clean manner, we start with a simple randomised experiment. In Treatment Group 1, participants consider investing between a risk-free asset with 5% returns and a risky asset with 10% average returns (the risky payoffs are approximately normally distributed with 18% volatility, truncated into nine discrete outcomes). In Treatment Group 2, participants consider investing between a risk-free asset with 1% returns and a risky asset with 6% average returns (the distribution of excess returns is the same). In other words, we keep the risk premium (i.e. average excess returns) and the Sharpe ratio of the risky asset fixed, and only make a downward shift in the risk-free interest rate. Participants are randomly assigned to one of the two conditions, with 200 participants in each condition. We find robust evidence that people in the low interest rate condition invest significantly more in the risky asset. 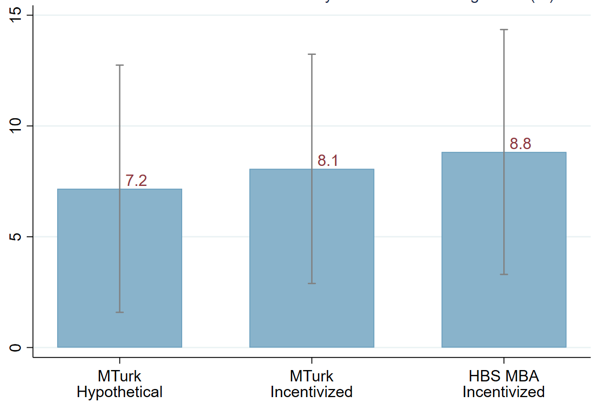 This finding holds among several thousand participants from Amazon's Mechanical Turk platform (representative of the general US population) as well as 400 Harvard Business School MBA students.1 The results also hold consistently across different settings (hypothetical questions and incentivised experiments). The average investment share in the risky asset increases by about 8 percentage points in all these cases, as shown in Figure 1. Note: This plot shows the difference between mean allocations in the risky asset between the low interest rate condition (1% risk-free rate, 6% average returns on the risky asset) and the high interest rate condition (5% risk-free rate, 10% average returns on the risky asset). Each experiment has 400 participants, randomly assigned to one of the two interest rate conditions. The first setting is a hypothetical experiment on MTurk, where participants consider investing $100,000 of total savings. The second setting is an incentivised experiment on MTurk, where participants invest experimental endowment. The third setting is a similar incentivised experiment with HBS MBA students. The investment decision in each case represents the simplest mean-variance analysis problem, where the solution should not be affected by the risk-free rate based on the textbook mean-variance benchmark. The treatment effect is also not naturally explained in more general frameworks, where absolute risk aversion is weakly decreasing in wealth. Moreover, in further tests, we also find considerable non-linearity in how investment decisions respond to interest rates. 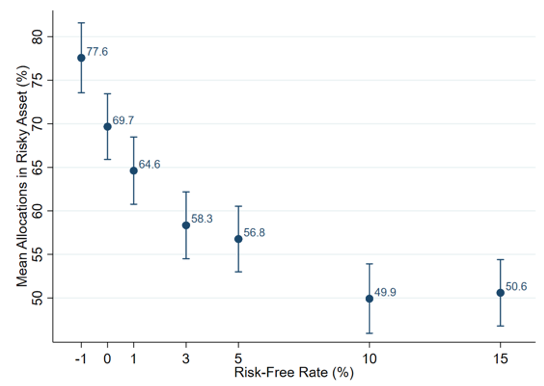 When we vary the risk-free rate from -1% to up to 15% across different conditions (holding fixed the excess returns of the risky asset and 5% risk premium as before), we find that reaching for yield is particularly pronounced as interest rates decrease below historical norms, but dissipates when interest rates are sufficiently high. Figure 2 shows the mean allocations to the risky asset in each interest rate condition in each test. This non-linear pattern is even harder to explain using a conventional framework. Note: This plot shows mean allocations in the risky asset across different interest rate conditions. Each condition has 200 participants, from the MTurk platform and they invest experimental endowments. The x-axis shows the risk-free rate in each condition. The mean excess return on the risky asset is 5% in all conditions. The y-axis is the mean allocation to the risky asset. The vertical bar shows the 95% confidence interval for the mean allocation. The findings in the US were recently replicated in the Netherlands by the AFM. As mentioned earlier, the AFM identified ‘search for yield’ as one of the top ten risks in its 2017 supervisory agenda. The regulators are keen to understand how risk appetite may shift in low and negative interest rate environments. To inform regulatory considerations, the AFM replicated the experiment among 900 Dutch citizens drawn from an online AFM consumer panel,2 using the hypothetical version of the original protocol translated into Dutch. We had contact before the replication to discuss the design and wording in order to mimic the original study as faithfully as possible. Participants are randomly assigned into conditions with interest rates from -1% to 10% (holding fixed the excess returns of the risky asset and 5% risk premium as before). Figure 3 shows the results in the Dutch sample (red diamonds). There is again significant reaching for yield and substantial non-linearity. The pattern across different interest-rate conditions is similar for the US and the Netherlands. 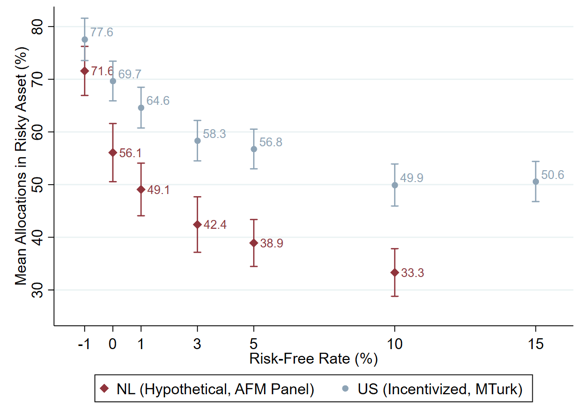 The absolute allocation in the risky assets is somewhat lower in the Dutch sample, both because the Dutch test is a hypothetical question and because the Dutch participants are possibly more risk averse in general than their American counterparts. Note: This plot shows mean allocations in the risky asset across different interest rate conditions. In the Dutch sample (red diamonds), each condition has 150 participants, from the AFM Consumer Panel and they consider a hypothetical investment problem. The light blue circles are results in the US sample as shown in Figure 2. The x-axis shows the risk-free rate in each condition. The mean excess return on the risky asset is 5% in all conditions. The y-axis is the mean allocation to the risky asset. The vertical bar shows the 95% confidence interval for the mean allocation. In Lian et al. (2018), we analyse two categories of mechanism that are important for understanding the individual-level yield seeking behaviour we document. The first mechanism captures the observation that people may form reference points for investment returns, especially over past experiences. When interest rates fall below the reference level, people feel dissatisfied and become more willing to invest in risky assets to seek higher returns. This observation connects to the popular view among investors that 1% interest rates are ‘too low’ in comparison to what they had been accustomed to.3 The observation also suggests a novel implication that the degree of reaching for yield when interest rates are low may depend on the previous economic environment. The second category of mechanism postulates that reaching for yield could be affected by the salience of the higher average returns on the risky asset in different interest rate environments. Specifically, 6% average returns relative to 1% risk-free returns may be more salient than 10% average returns relative to 5% risk-free returns. Taking it to an extreme, if the risk-free rate is 80% and there is a risky asset with 85% average returns, the additional payoffs may look almost trivial. The observation relates to the ‘salience theory’ of Bordalo et al. (2013); it also connects to the well documented phenomenon, often referred to as Weber's law, that people tend to evaluate stimuli by proportions. Both mechanisms help to understand the substantial non-linearity in reaching for yield. We also design additional tests to investigate each mechanism specifically. For history-dependent reference points, we find that investment history has a significant impact on investment decisions – for instance, when participants first make investment decisions in the high interest rate condition and then make decisions in the low interest rate condition, they invest substantially more in the risky asset in the low-rate condition. For salience, we study investment decisions when payoffs are presented using gross returns (e.g. instead of saying 6%, we say that one gets 1.06 units for every unit invested). As the proportions shrink and the higher average returns of the risky asset become much less salient, risk taking diminishes, especially in the low interest rate condition, and reaching for yield is also dampened. The intrinsic reaching for yield tendencies at the individual level can affect financial markets in several ways. First, it is relevant for the decisions of households and end investors. Institutions’ decisions are also frequently influenced by the preferences of their clients. Second, the yield seeking behaviour of end investors, which may drive flows into financial institutions, may also intensify some of the institutional frictions (e.g. the relative performance frictions studied by Feroli et al. 2014). Third, the individual level mechanisms may also affect finance professionals. The behaviour doesn’t seem to diminish with education, wealth, and investment experience, and is quite significant among MBA students who have worked in financial institutions. For regulators like the AFM, understanding individual-level yield-seeking behaviour helps to better map out market segments that could be affected by reaching for yield. Institutional frictions may not be the full picture; it’s also important to monitor consumer product markets, and to recognise the intrinsic tendencies investors may display even in cases where institutional frictions are not severe. The AFM is actively monitoring risk-taking dynamics, and the development and marketing of high(er)-risk products. The efforts aim to ensure that investors attend to the risks they may be taking, especially when consumers consider moving savings away from deposits that are covered by a Deposit Guarantee Scheme to investments that aren’t covered. Findings in this research corroborates the intuition that consumers are more likely to shop around for alternative investment options in a low interest rate environment.5 Investment products should provide adequate information and disclosure about the additional, novel risks they entail. The AFM warned about possible unfair comparisons in advertisements and marketing of investment products in July 2017. To empower Dutch consumers, regulators have also published a checklist of questions to consider when making investment decisions. Taken together, this study helps the AFM in its mission to promote fair and transparent financial markets, and to contribute to a prosperous and sustainable financial system in the Netherlands. Bernanke, B S (2013), “Monitoring the Financial System”, Speech at the 49th Annual Conference on Bank Structure and Competition, Federal Reserve Bank of Chicago. Bordalo, P, N Gennaioli and A Shleifer (2013), “Salience and consumer choice”, Journal of Political Economy 121: 803-843. Bordalo, P, N Gennaioli and A Shleifer (2017), “Memory, attention and choice”, Working Paper. Celerier, C and B Vallee (2017), “Catering to investors through security design: Headline rate and complexity”, Quarterly Journal of Economics, forthcoming. DellaVigna, S, A Lindner, B Reizer and J F Schmieder (2017), “Reference-dependent job search: Evidence from Hungary”, Quarterly Journal of Economics 132: 1969–2018. Feroli, M, A K Kashyap, K L Schoenholtz and H Song Shin (2014), “Market tantrums and monetary policy”, Working Paper. Kahneman, D and D T Miller (1986), “Norm theory: Comparing reality to its alternatives”, Psychological Review 93: 136-153. Kahneman, D and A Tversky (1979), “Prospect theory: An analysis of decision under risk”, Econometrica 47: 263–291. Lian, C, Y Ma and C Wang (2018), “Low interest rates and risk taking: Evidence from individual investment decisions”, Working Paper. Powell, J H (2017), “Low Interest Rates and the Financial System”, remarks at the 77th Annual Meeting of the American Finance Association. Rajan, R (2013), “A Step in the Dark: Unconventional Monetary Policy after the Crisis”, Andrew Crockett Memorial Lecture, Bank for International Settlements. Stein, J (2013), Remarks at the Restoring Household Financial Stability after the Great Recession Research Symposium, Federal Reserve Bank of St. Louis. Among the general population participants, about 75% have college education or above and 60% participate in the stock market; among the MBA participants, 40% have worked in financial institutions and 80% participate in the stock market. The panel was founded in 2014 and is used by the AFM to study household investment decisions in financial markets. The respondents are primarily male (81%), highly educated, and older (mean age is 61; the interquartile range is 54 to 70). About half of the panel-members invest in the stock market, in contrast to less than one in five in the general population in the Netherlands. Respondents don’t receive financial incentives, but do have high response rates (generally >50%). Reference dependence is a well-recognised feature of decision making (Kahneman and Tversky 1979), and increasing research points to the importance of history-dependent reference points (Kahneman and Miller 1986, Bordalo et al. 2017, DellaVigna et al. 2017). Such data don’t seem to be available for the Dutch case. Celerier and Vallee (2017) analyse low interest rates and the popularity of structured retail products in Europe.